Title: RAGS AND TATTERS A Story for Boys and Girls. Description: London, J. 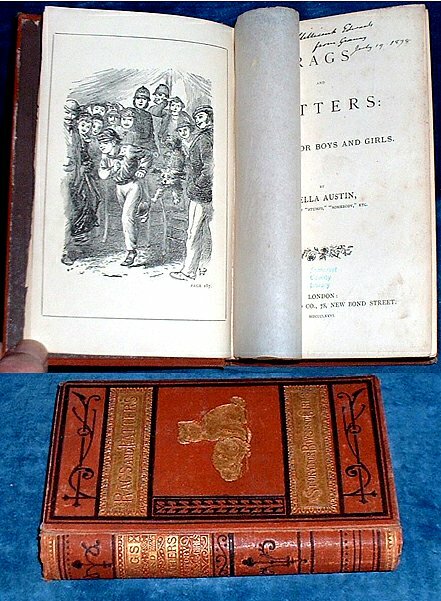 Masters and Co. 1876 Frontispiece signed W.P. . 162 x 100mm reddish brown cloth blocked in black & gilt, elaborate title panels to cover & spine + gilt pair of Scotch terrier dogs to front cover (spine with 5mm split to head of hinge, vents and wrinkled but covers still attached). Inscription to Millicent Edwards July 19 1879 at head of title, iv + 104pp. Some signs of use, LACKS 2 leaves pp59/60 & 83/84 (Osborne 619 2nd edition also lacks pages. First edition was dated 1849 the 2nd & 3rd edition undated but early 1850's. Most later editions like this are differently paginated).